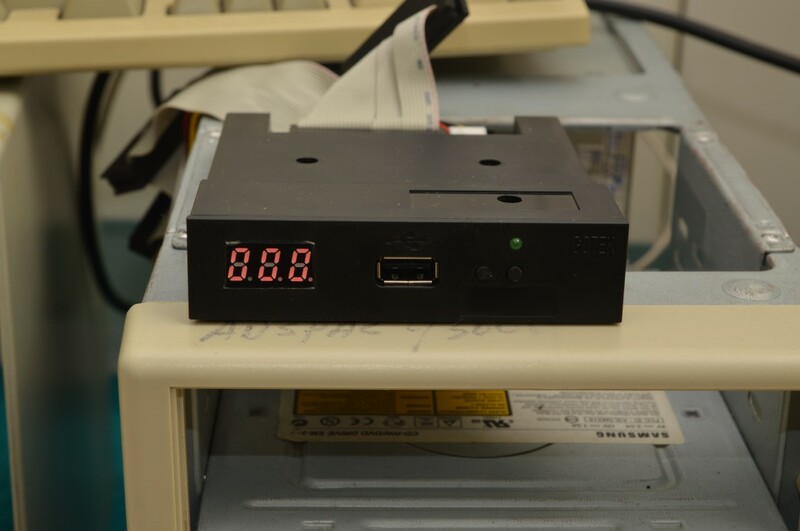 Following on my previous review of a 100-bank low-cost USB floppy emulator and testing of the emulator, I realized that the eBay market saw the introduction of another floppy emulator. This one is the GoTek System SFR1M44-U100K 1000-bank USB floppy emulator, also attractively priced around US$20. The device itself has the letters GOTEK in the moulding, and features a three-digit seven-segment LED display (still covered with plastic tape), a USB port, two push buttons and an access LED. The green LED lights up whenever the drive is active. The right button is used to increment the “ones” position, the left button increments the “tens” position, and pressing both buttons momentarily increments the “hundreds” position. Holding them both may engage the auto-format function which will erase all content. In use, this drive allows you to increment the bank during accesses but this may lead to data loss. The increment function appears to cause the change line to be toggled to signal to the controller a disk removal. The other emulator locks-out the increment/decrement during accesses. The casing itself differs from the other emulator, with a distinctive “step” shape, and the use of only three screws to secure the unit together. There was also the provision for branding and other button labels which are not provided. The step shape is clearly visible here – and may be an advantage when trying to shoehorn the device into non-standard floppy drive enclosures, although those often have non-standard interfaces as well. Exposed at the rear are jumpers – some are labelled for drive select, and others are undocumented. There are also through holes unpopulated which are also for configuration by jumper. The 34 pin interface has the keying pin (pin 3) still in place (just like the other emulator I had), there’s no harm clipping this off for cables with the hole blocked. It’s probably a good time to note that this emulator does come with an 8cm CD (groan!) however, the tools provided are arranged arbitrarily, are poor and (some) improperly licensed. I’ll show you some of it later on. It also comes with manuals, although for a variety of versions of products which are not related whatsoever. It appears there are separate versions for 720kB, 1.2Mb and 1.44Mb format, and there is a format which images the disk, and another which interprets folders as a disk – and customized versions for sewing machines and networked applications. There are some documentation which refers to a 100-bank model, and others to a 1000-bank model and indeed the tools seem deficient in the least. Most of this is there to confuse you, so I’d suggest avoiding the CD if you can. The datasheet is provided though with some jumper explanation. 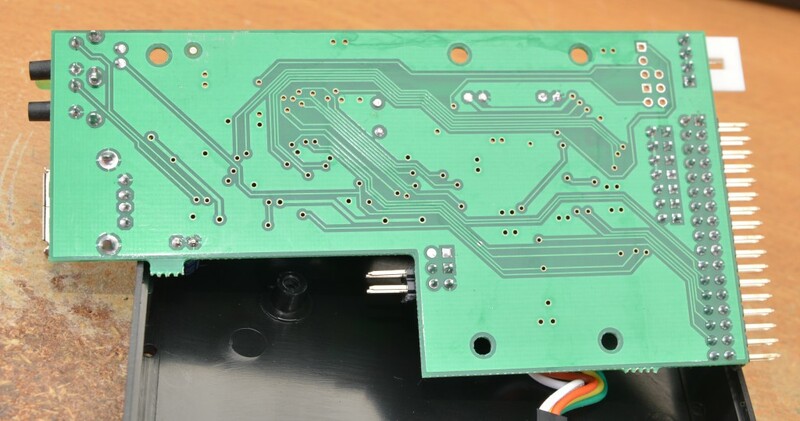 The internals consist of a green PCB populated with an STM32F105 ARM Cortex-M3 CPU from STMicroelectronics, a NXP 74HC04D Hex Inverter Buffer, a 3.3v regulator, and a few supporting resistors, capacitors and a crystal. It’s a little simpler looking compared to the other emulator – having no external SRAM or multiple ICs – the magic will obviously be in the programming of the ARM CPU. I plugged it into the same old Windows 95 box that I have running (since it’s capable of non-standard formats) just to give it a go. The unit would display 000 without a USB stick connected, and would display the same once a stick is connected. Formatting the disks (with verification) with WinImage was not a problem at 1.44Mb. Surprisingly, a format at 1.2Mb also succeeded. 720kB and all non-standard (1.68Mb, 1.72Mb, DMF, 820kB, 360kB, 320kB, 180kB, 160kB) all failed. Do you know what this means? This is the same scheme as for the other emulator which means, in theory, the first 100 banks will be interchangeable between both emulators without requiring any attention. The pattern is obvious and tells us that for 1000 floppies, only the first 1500MiB of any USB key will be used. Therefore, a 2Gb USB key is enough! A commenter on my previous post said that Ipcas has a similar floppy emulator to the other emulator and had software downloads. Curiously, their software download is similar to the software provided with this GoTek system unit – but does not appear to work. The other pieces of software is UFloppyManager.exe with a plethora of options related to pre-formatting a USB key for use with the drive, but I haven’t managed to get it to work meaningfully either. So it’s pretty much a fail all round with the software. Thanks to the Kryoflux, we can get a little more information about how the drive presents itself to the host. On connecting the Kryoflux, the calibration option returns a value of 84 tracks (0-83). The Kryoflux itself doesn’t test for larger values – it may be possible to get 85! This is different to the other emulator which tops out at 80 tracks (0-79). When reading the “virtual” floppy, it is very close to 300RPM with a clean signal – on all tracks! The first question we should ask is what is being returned on those tracks? A quick peek in the hex editor reveals that those tracks indeed return the data “in sequence” from the USB key – so if they were never written by a host, they will return whatever was remnant on the USB key in the “gap” between images (in my case, 0xBAADF00D). Another question is what happens when we attempt to read a disk which is formatted as a 1.2Mb bank? Well, as it turns out, the unit emits the full 18-sectors per track at 300rpm – not the expected 15 sectors per track at 360rpm. This makes the unit that I have unsuitable for emulating 5.25″ HD drives – only good for 1.44Mb HD 3.5″. For people wanting to deal with unusual format disks, it’s a disappointment – but at this price, I really don’t mind. It works as advertised for 1.44Mb HD MFM 18-sectors per track 500kbit/s format. The software is a bit cryptic and generally rubbish, but the “compatibility” suggests there may be an “unwritten agreement” somewhere about USB Floppy Emulation, or maybe it’s a case of someone wanting to remain compatible with the “status quo”. Whatever it is, it’s good and bad news. While the first 100 banks may be compatible, additional banks following the same pattern are inaccessible from certain emulators – and their handling of track 80+ is different. I suppose the good thing is that the reported RPM of this unit is much closer to what is expected, although only having increment buttons and the potential for changing the bank during a write is a bit of a risk. This entry was posted in Computing and tagged new stuff, review, storage. Bookmark the permalink. Hi, I want to buy USB simulator for Brother BAS 326 LS, so you can supply it to me. I do not manufacture, supply or sell any products. I do not have any links with suppliers or manufacturers. You will have to do some looking around to find products suitable for your needs. This is completely useless piece of both hardware and software as it needs some rework, as I think. My issue is Yamaha can’t see regular USB stick content, but it is allowed to format it its own (Gotek’s one) way: 1000 virtual partitions. On the other way I’ve got Windows which obviously can read/write regular USB sticks, but can’t see one formatted by Yamaha/Gotek, except first partition. So what I’ve got is huge USB stick formatted nobody-knows-why-into-1000-partitions but I am able to read/write just 1.44MB – because all of those partitions are as big as floppy disk. As far as I know WIndows can’t read more than 1 partition on USB flash device, so it’s main pain. UFDiskManager can read all of those partitions, but God only knows how to save data back :/ as all is in Chineese. The problem mainly is that it is NOT partitioned in a standard way into 1000 parts. MBR Partition tables themselves cannot keep track of that many partitions, so data is written raw to flash sectors following the formula I provided. 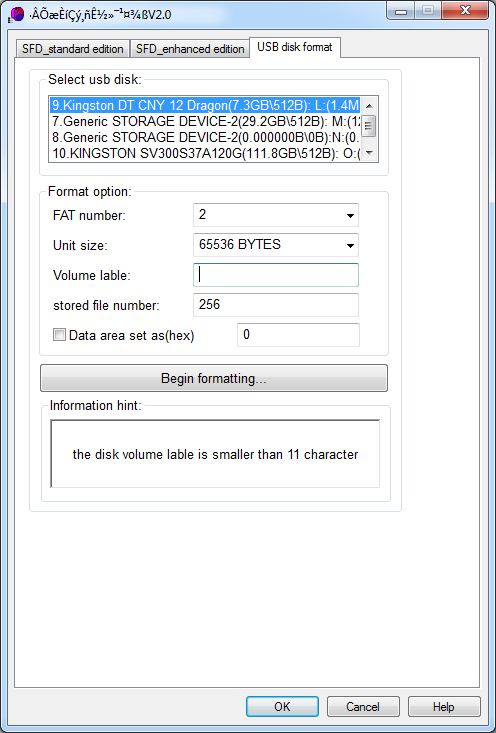 The easiest way to access each disk is to image the USB’s content and overwrite or extract certain sector ranges as required. Using Linux and the utility dd is most convenient and reliable, as Cygwin’s dd does not have device level access. Once you extract the image of interest, you may mount it via loopback device under Linux or try WinImage under Windows. Someone could use the information I’ve provided to write a ‘better’ Windows utility, and use it to extract individual disk images and recompile an image for USB. So no, it’s not a point and click affair for most users. I personally don’t find the software provided to be adequate for anything – it’s buggy, and it really isn”t flexible or fully featured. That’s why we try and overcome our problems by understanding how it works. on /mnt/tmp . This uses the loop device internally. sizelimit is optional but helps against corruption of other disks in case that the disk image is inconsistent. I have formatted the USB stick with 2 partitions, the first for Gotek has partition type 11 (hidden FAT16) in order not to have it mounted automatically, size 1536000k. The second is normal VFAT32 just to make normal use of the USB stick for other purposes (why waste 14GB?). If you don’t want to keep unmounting the automatically mounted partition and are not bothered about the waste, you can just work with a single partition. I took a quick look at it, and you’ve definitely made good use of the loopback mount abilities under Linux. Would be very helpful for all users, thanks for your work! Is this model for this synth? Unfortunately, I can’t answer that. You will need to do your own research. This post has explained that the emulator itself as supplied is capable of emulating 1.44Mb IBM High Density 3.5″ style floppies only, if that is what your machine requires, then this should work. However, dealing with the image format requires some “handywork” in terms of extracting sector ranges for reading and writing, best done on linux. However, if your machine does not utilize the IBM format (say, non 1.44Mb 80-track x 18 sectors per track x 2 sides x 512 bytes in MFM format) then it won’t be possible to use this one. If it uses 720kB “Double Density” encoding, there may be a jumper setting to change this, however, I have not tried it. None of the “cheap” emulators are capable of unique formats (e.g. Mac GCR, Atari, etc). Maybe try enquiring with others that have had the same synthesizer and done an upgrade themselves. Naturally, your existing drive has to use the 34 pin interface as well. Well, I suppose that solves half the puzzle. That drive will have the 34-pin interface, and is a high density drive to my knowledge. It’s commonly used for IBM format desktop computers. Whether your synthesizer stores its data and accesses the floppy disk in the same way, I cannot tell. Also, I cannot tell if the emulators will have trouble, as some people report the disk-change toggle isn’t working properly – when you change the disk bank on the emulator, the machine doesn’t know the disk has been removed and changed. The only way to know is to try, or ask someone who has the synthesizer and has tried themselves. Hi, recently bought the SFR1M44-U100K, installed & used it successfully with the Roland XP50. To make it work, you need to use it with only one jumper on the M0 (Motor-off) setting. So, no jumper on s0/s1. HI Peter, I know you posted this almost 2 years ago but I am hoping you can help me. I just installed this device on my Roland XP-50 and I put the jumper on Motor on pins and that is the only jumper I have on. The xp-50 keeps saying unformatted disk. How did you get yours to work? Hey Jeremy! I’m in a similar situation, the Roland XP-50. Constantly I can see a screen that unformatted disk. Have you ever found some solution to the problem? Hi There if This could Help — Just bought recently Gotek SFR1M44-U100K-R and it works fine with Roalnd XP50 ……Jumpers were already preset JA , JB and MO 3 jumpers…. I purchased the usb gotek SFR1M44-U100K floppy emulator and have it installed in my akai mpc 2000 sampler. I am trying to partition my usb 8gb flash drive into 1000 1.44mb folders. I want to use the usb flash drive to load the OS for the akai mpc 2000. As well as use the available partition folders to save and load wav. sounds. I also want to use it to save sequences from the akai mpc 2000. I plugged my 8gb usb flash drive into the gotek SFR1M44-U100K usb floppy emulator. I started the format process. Holding both buttons down at the same time and then releasing the buttons once the display reveals “F01”. Then I wait until the display reveals “000”. Then when I plug the usb 8gb flash drive into my laptop to load wav. files to it. It recognizes the usb 8gb flash drive as a 1.44mb formatted flash drive. I cannot load more than 1.44mb worth of files. Is this correct? I would like to save more than 1.44mb of sound on the flash drive and be able to access it to load into the akai mpc 2000. when I plug the 8gb usb flash drive into the go tek SFR1M44-U100K floppy emulator and then power up. I’m able to load the 1.44mb. Which consists of the OS for the akai mpc 2000 and 1 wav. file. I can create 1000 folders on my laptop in the 8gb flash drive but I cannot put the OS in any folder to boot my akai mpc 2000 with. If it is in a folder it does not find it. Also, I can save any wav. files in a folder on the usb 8gb flash drive as well. Only when I try to find a folder using the akai mpc 2000 to load it. It does not find folders and does not find the sounds. I have tried several partition programs and have had the same result. Any ideas of what i am doing incorrectly? Also, when I go to load my OS from the usb flash drive in my akai mpc 2000. It loads when it is not being put in any folders and the display on the go tek SFR1M44-U100K floppy emulator reads “000”. Isnt “000” suppose to reset the flash drive or the floppy emulator? – There are several version of the GoTek emulator – some use folders, this one uses raw floppy images. 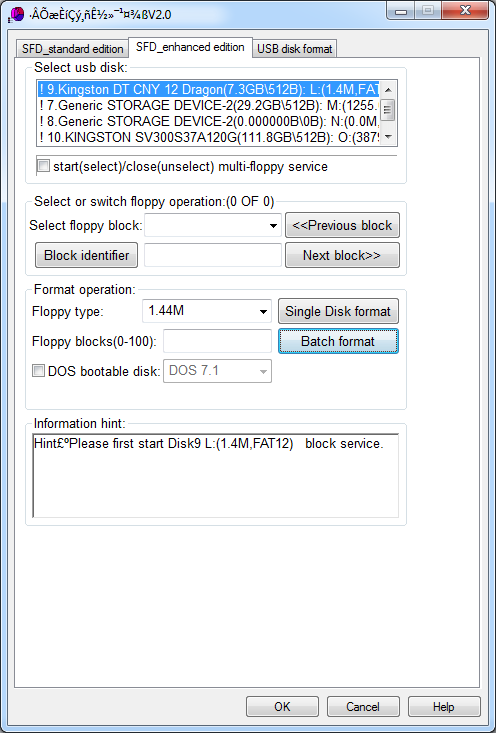 – It will emulate 1000 disks from a USB key. Each disk is in MFM format, of 80 tracks, 2 sides and 18 sectors per track and 512 bytes per sector – High Density (also known as 1.44Mb IBM format). Each image will only be up to a single floppy in size. – You must work with raw floppy images and write the raw images to the contiguous sector numbers as the emulator expects. This is not like dragging and dropping files. The offsets required to write the images to are provided in that article and can easily be calculated. – The software provided to inject and extract files is relatively limited and I haven’t had much success with it, hence the “direct” method I posted. It’s complicated but that’s life! – The first 1.44Mb partition is accessible only because of the coincidence it starts at sector 0 of the USB key. The next starts at offset 1536kB (or 1572864 bytes). – Dragging and dropping files may not be enough to create some types of floppies as the data within the boot sector is not copied – this may be required to boot the device. – 000 represents the first floppy disk emulated (it goes from 000 to 999) – it will even show this even if the format of the USB key is not correct and it is not accessible. I’m sorry but I don’t have the time to elaborate any further on this. Perhaps you could get it to work using my linux script? You don’t strike me as a typical linux user but if you’re in for another ‘fun project’ this should get you up and running. Studying the source should help you get a feel for what is going on. Especially if you ‘google’ the stuff you don’t know. i have the emulator for my tajima it reads the usb well the only problem is every time that i unplug the usb and plug it back in i have to turn the machine off and on for the machine to read the usb any idea why is that happening? It’s likely because the disk change notification signal line is not emulated by the emulator. Just one of the many issues that can happen with such devices, and at times, even real floppy drives. Thanks for the useful information. I bought one of these but the software CD arrived cracked so I couldn’t access the applications. Would you be able to share it? Or, do you have any recommendations for other floppy-image management software. The software it came with was rubbish, never really functioned properly, so I pretty much got rid of it. Unfortunately, I don’t think I have it anymore – and even if I did, I would not be allowed to redistribute it either. Instead, you can try working with the USB devices in raw mode by working up an image and then writing it to the drive. The format follows the same rules as the 100 floppy disk emulator I reviewed prior (see http://goughlui.com/2013/04/24/review-unbranded-1-44mb-usb-100-floppy-emulator/), with the exception there are 1000 slots rather than 100. I have one of these FDD emulators, the software “Batch Manage Tool V1.31T” that can be found on the IPCAS website works for me up to 100 floppies. Must be run as administrator though. The disk-change signal does not seem supported on my version of the firmware, that is quite odd as the hardware is actually built to output signals on pins 2 and 34. As well as an alternative firmware for the Amiga computers. I just purchased this emulator (will arrive soon) and will install it in my Roland XP-60. I will be so happy if this baby works. I will post after its done and if I have questions will ask too. HI just installed this drive on my Kawai K500K. Worked first time with the jumper left as was from factory. I could format USB stick and had 670 partitions on a 2 gig stick. As mentioned Win7 only saw first partition (000) I could load files to this and then load files to my K5K. Even managed to update the OS system. I can however save files to any of the USB stick partitions and reload them. So I just use (000) to load files from PC onto the K5K then save them to a different partition. So now my USB stick has numerous floppies saved to the USB that I can load onto my synth. I hopeI can do the same with my roland xp-60. Can you load(how many) midi files in your kawai k500’s internal memory? I installed the emulator in my XP-60. It turns on. I tried to formatt a 2.0 GB usb by pressing noth buttons while turning the keyboard on. after it started to (I think) formatt the usb, I release the buttons. It went up to 480 and then Three zeros. but tried to see the disks in a mac computer, there is nothing there. I want to load songs, what should I do next? I’ve seen videos of people uing the format software but I can not find the place to download the software to format my 2.0 GB flush drive (100 or 1000 virtual floppys). The CD that came with my emulator did not have any aplication. I am using a windows xp tried to format the usb drive. WOW!!! I am so happy knowing that this emulator GoTek System SFR1M44-U100K works with my ROAND XP-60. Since I have all my midi files on a mac computer, to test it I emailed myself three or four MIDI files to my Windows XP computer where I had my 2.0 GB USB already formated. Then I copied them to one of the virtual disks, after that I loaded them in my roland xp-60 using the GoTek System SFR1M44-U100K and WOW,,,, it works. My next project will be to copy all my midi files to my USB and try them all. its going to be fun. I recorded the process and planing to put a youtube video for everyone that have the XP-60 and want to try the emulator. Yeeeaaaa!!!! Estoy muy contento de saber que el emulador GoTek System SFR1M44-U100K funciona en mi ROLAND XP-60. Como tengo todos mis secuencias MIDI en una computadora MAC, para saber si funciona me envie los archivos MIDI a mi mismo via email. Ya mi computadora XP donde tenia instalada y formateada mi memoria USB de 2.0 GB lista, cargue tres o cuatro archivos midi en uno de los diskettes virtuales, despues los cargué en mi ROLAND XP-60 via Tek System SFR1M44-U100K y Si funcionó. Como tengo bastantes secuencias en diskettes, mi siguiente proyecto es pasarlos todos a mi memoria USB. Será una marabilla una vez que todos mis midis esten en mi usb. Grabe el proceso y estoy planeando poner un video en youtube para todos los que tengan el ROLAND XP-60 y quieran instalarle ul emulador. i read it 3.5 turn at 360 instead of 300 would you have any idea ? of some kind of gotek cheap drive that could do the job ? Sorry, as far as I can tell, the Gotek will only output data in the IBM format, and will not emulate 360rpm. 5.25″ (1200KB) disks spin at 360 RPM and hence only time to write 15 sectors. 3.5″ (1440KB) disks only spin at 300 RPM so 18 sectors fit in each revolution on slightly higher quality media. The device should work fine for imaging/reading/writing 1200KB disks but would be slightly slower and appear to contain extra garbage that the system should ignore (the 3 remaining sectors) during read and write in most cases. That may or may not work depending on the controller in the device, as the controller for a 360RPM drive expects the index marks to come by every 166.7ms, whereas with the 300RPM drive, they would come by every 200ms. This difference could be long enough that the controller signals an error or times out while reading/writing a track. Secondly, if the controller “phase locks” to the index pulses rather than blindly writes at a fixed bitrate, this would stretch out each of the pulses by 20% which might cause the emulator itself to fail to demodulate the pulses correctly and record them as an image file – remember, the emulator does NOT record waveforms, and merely records the demodulated data itself. Thirdly, whether it works or not also depends on the behaviour of the emulator, especially in regards to an incomplete write where there is no sector headers as expected, and the behaviour of the device, whether it accepts extra sector headers. The sector headers actually contain geometry data, which is normally the side, cylinder, and sector number. Because the emulator is mismatched in capacity, it will prefix its data with possibly unexpected values which may cause the controller in your device to throw an error. As usual, it’s a case of YMMV as it’s highly dependent on the design of the device it’s going into. Thank you very much for the information! It was very slow and frustrating using the floppy interface to copy my disks to the emulator, so this is a godsend. It was also going to be very awkward to update the files in disk slots 100+ as it would have meant removing the emulator from the system it was installed in. Great work Mark! I think a lot of people would be very happy to be able to work with the USB keys easier than installing Cygwin or running a full blown Linux distro. Your efforts are much appreciated! I buy 1GB USB’s to use with this emulator. They (~500+ units) have worked using vendor supplied USB_Floppy_ManagerII_V1.31T that came with the unit. However, recently many of the USB’s are not being recognized by the same Gotek Unit after the successful 100 section formatting. This unit is a constant as older USB’s from the same vendor (private labelled) are the variable. The vendor says that “nothing has changed” in the USB’s. However, they used to be recognized consistently by the Gotek Drive (or any of the 12 other Gotek Drive I may have in stock). Now I am getting only about a 5% success rate from formatted USB’s recognizable by the Gotek Drive…. Any idea what the USB vendor could have changed (unadmittedly?/unknowingly?) to cause this? Thanks for your thoughts & Best Regards. In truth, many USB memory device vendors do not manufacture the devices themselves and have little control over the manufacturing except for maybe specifying the minimum finished capacity, enclosure logo and colours of the product. There could be many slight differences internally that can cause issues – a change in the internal controller chipset may have a different version or vendor of chipset, which might take just a little longer to “get ready” and respond to commands after power-up. If it is long enough, it is possible that the Gotek “gives up” before it gets ready and it never gets detected. Despite having the same chipset, it could be possible that newer manufacturing tools were used with the same chipset resulting in newer firmware being loaded – if the new firmware changes these timings, then the possibility for issues is likely. They may have changed their supplier of USB connectors – this sometimes can cause bad connections which might be solved by gently levering the USB upward or downward and applying pressure continuously. If that works, then it is likely you have a contact problem – a slight bending of the connector shell towards the tongue could help apply some pressure and make the contact better. Maybe they’ve changed their clock crystal tolerances or supplier – in which case, you could find some that fail to connect under some temperature combinations, or on the PC will complain of “Your device can perform faster if it is connected to a USB 2.0 port”. The clock crystal provides the timing source for synchronizing the transmissions from the USB key to the signals from the host – outside of a certain range of tolerance, it will cause bus errors and failure to communicate, especially at higher speeds. Aside from that, maybe the newer units have more chips in them and require more power – if the Gotek’s supply is “weak”, then the Gotek’s output power is going to be somewhat weaker than that. Some units may be more tolerant of this than others. If you don’t care so much about the devices, I suggest you might want to tear them apart and do a visual confirmation between the units that are known working, and those that aren’t. Also, once identifying the chipset vendor, you can probably grab some manufacturing tools for that chipset and flash combination and check the internal manufacturing configuration info as well to verify firmware. If that’s too much trouble, then it’s probably a good idea to start sampling other suppliers until you find another that works for you. Thank you for the thoughts. I have been resisting proving the supplier wrong with the dissection of good vs. bad… They included the OEM manufacturer in the check on “nothing has changed.” We share your skepticism. Will investigate timings, tolerances, power supply, & alt. suppliers as suggested. Have Fun! Update: Vendor’s MFG stretched the truth, in review we found 11 major varieties of USB board in our stock, 10 of which work fine. We RMA’d the remaining stock of uncooperative USB’s & found the replacements “worked fine”. Thanks again for your help Gough. Happy hunting. Having seen this article, I ordered this GoTek 1000 disk emulator. Wondered why the maths wasn’t working for this. Couldn’t pull or push good images. Seems this emulator spaces the disks every 190000h. Anyone else? I’ve got a second one on the way so will see if that behaves the same. It may explain why the ipcas software won’t work with it. That could well be possible as it may have a different firmware running on its microcontroller as it may have slightly different or improved emulation abilities. Arrgh! Okay. I really hope the second one has the same firmware or at least geometry when it comes. Is there a way to check the firmware version on the unit? Not to my knowledge, unless you have a debug adapter (JTAG possibly) for the STM32G and then maybe you’ll still be thwarted by code download protection on the chip itself. Typical. The second unit arrived and has the geometry you specified. I need to put something consistent on both. Is the HXC firmware the only way to go? I haven’t used HxC, and it was in beta when I last checked, but many people seem to like it for its more advanced capabilities and Amiga emulation if I recall correctly, but it probably uses an image-file based system rather than the raw sector access geometry I mentioned in the article. Sorry I can’t really be of much help :\. Can you boot off it though. That’s the question? Provided the loaded image is that of a bootable floppy disk, of course. However, users have expressed difficulty in booting from images other than the first image because they couldn’t select the right image before the computer tried to access the drive and thus “holds” the image in place. Some have resorted to a dummy image in the first slot that is not bootable, then swap to the correct image and warm-boot the attached device. olá tenho um ROLAND EM 50 e comprei um emulador usb de 3 digitos da gotek e não consigo configurar algem me pode ajudar qual a posição do jumper e como formatar a pen no windows 7. First of all: Thank you very much for these in-depth reviews/descriptions. Way better information than anywhere else on the net (including the original manufacturers of these devices). I also use USB Floppy emulators in Akai MPC2000 models and have a question about it. I have an Imation 4GB USB drive and used the software provided by ipcas in the Gotek Emulator – worked like a charm, no problem. Since I service and sell MPCs and something like 100 floppies are perfectly enough I ordered a bunch of noname 1GB drives and they simply won’t run (looks fine in Windows but the MPC doesn’t really recognize the emulator anymore and just switches through the SCSI ports until it gives me a “Disk read error”). I tried to format the drive inside the emulator itself, used the software that came with the Gotek as well as ipcas and ketron but it just won’t work. Can anybody tell me what physical difference there might be in usb drives that makes some work and others not? I would like to have some 20 of these drives ready to go and so it is a little frustrating to just order drives trial and error style. It could have to do with the time it takes for the USB key to get ready after power is applied. Different USB keys have different controllers, some of which do take several seconds to even almost 10 seconds to get ready after being plugged in, and I think the emulator will time-out on those types of drives. Unfortunately, this isn’t a spec which most drives actually have, and the time to ready can vary depending on the type/speed of flash in the actual key, as well as its block size, and whether it was correctly ejected or not (as the indirection/mapping tables may need to be repaired on power up and that costs time). It’s a case of sticking with what you know works, and changing only when necessary … but I suspect smaller capacity drives of an older MLC vintage tend to recognize quicker than some of the latest TLC USB3.0 capable devices. It could also be that there is some incompatibility in the firmware to do with how the drive identifies itself geometry-wise and or with the USB speed as well. Unfortunately, it’s hard to know exactly what is going on without someone that has an expensive USB protocol analyzer to watch them initialize. I can create that floppy 100. How to create 1000 Floppy? Just make sure you buy the 720 kb, not the 1.4 MB. I have seen your review last 2 week, then I bought this FDE , I just received yesterday, I can not use it, I have download Ipcas software, but seems it’s not compatible with Gotek (I formatted USB by Ipcas software – DONE with 100 floppy, when i put it to FDE, it don’t work, I format by my computer windows 7 again, FDE recognize without data, when i put USB back to PC, I saw SYSI01.DAT size 6 MB on folder named “USB” on USB . I have contact to buyers, he put handcuffs on me. My PC is Windows 7 OS. Could you please to help me Chinese software? Does anybody have the original Firmware of the Gotek Emulator as a .hex file? I wanted to Flash the device because It didnt seem to work with my mpc 2000 drum Computer. But the descriptions and modified .hex files on the web seem to work mainly for Amigas, which I didnt realized early enough. Read the reply above, that comment suggested you need to buy the 720k unit, not the 1.44M (the …1M44… part presumably means 1.44M). Ebay sellers typically write common brands/models on their headings, so look for that. If you need more details, might be worth finding a forum for users of Korg I3 and see if anybody their has experience. I cannot seem to get this to work. Even if I forgo all software and format the stick in the emulator drive itself, then plug it in my computer and copy a file to it (It shows up as a single 1.4mb USB drive formatted in FAT) I can’t read it on the emulator. It always tells me the disk is not formatted correctly. Is something broken or am I doing something stupid? I have been puzzling for 4 full days to get this device working on my Roland G-800! The clue i found in the fact that a G-800 is NOT capable to “see” the difference between an “A” drive, a “B” drive etc…. The processor which is responsable for recognision is NOT present in a G-800 so this is EXACTLY the reason why you should NOT have a jumper on S0 or S1! so keep these clear! Secondairy….. the G-800 has NO motormanagement for the floppydrive because that is the same processor which does the recognision which is not present as said before….therefore the “MO” should be OFF so that NEEDS a jumper. The floppydrive gives a “ready signal” when a floppy is present and preloaded, so the jumper “JA” should be set too! And last but not least it needs read/write permission so jumper “JB” has to be set too! Of course i did e read and a write session on multiple Vdisks made on an USB-stick and with success! Final conclusion: the jumpers “MO – JA and JB” should be set for a Roland G-800 if the original floppydrive is a Chinon FZ-357! Now my last problem is the software to create the USB-sticks…… the present software is capable to create a maximum of 100 VDisks, but the device supports 1000 VDisks….does anyone has found some good and stable software to create the 1000 VDisks which works on a 64-bit Windows 10 laptop? The SFR1M44-U100K USB SSD FLOPPY DRIVE EMULATOR GOTEK Also Works For You Lighting Techs Who Have A Jands Hog 1000 That Want To Swap Floppy Drive For USB, I Have Hog 1000 & It Works Perfectly. can any1 tell me wht the little cd is for?